South Africa have slipped seven places in the latest Fifa world rankings. Bafana Bafana now sit in 74th position in the list, released on Wednesday. Only a week ago South Africa Football Association CEO Robin Peterson said the country's target for the next 10 years was to "be in the top three in Africa and the top 20 in the world". Ivory Coast remain the highest-ranked African side at number 16 - and the Elephants are the only team from the continent to be in the top 20. 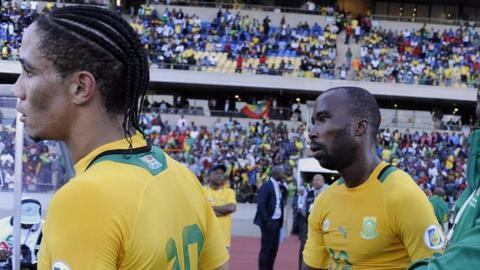 South Africa will, however, get plenty of opportunity to improve their ranking over the next six months, with a packed programme of pre-Africa Cup of Nations matches, the tournament itself and then 2014 World Cup qualifiers in March. Algeria have taken over from Ghana as the second-highest ranked African team, with Libya and Mali completing the top five, followed by Egypt, Tunisia, Gabon, Zambia and Sierra Leone.